I went straight back to Malin's apartment after she kicked me out of the café. I tried to entertain myself in her boring place by searching for something fun to do. I looked in all of the closets and cupboards for a board game or something exciting, but all I found were boring-looking books. So I ended up sitting on the couch in the front room for hours, just staring outside at the gloomy weather as the rain dribbled down the window. I thought about going back to the party, but I decided not to. I couldn't get caught by Lawne or somebody going back upstairs to the attic. They'd probably think I was crazy. Kin slept nearly the whole time. He must have been bored out of his mind, but honestly, there was nothing to do. So I brought out Malin's journal and ran my hand over the dirty crinkled pink cover of it. It was hard not to just open it up and read the whole thing. But I didn't want to spoil the surprise. After all, I'd just find out about the jewel sooner or later, when Malin and Enzie came back. I looked over at the large grandfather clock in the corner of the room. It read one-thirty, and Malin still wasn't back. She had said she would be back at one. I sighed and slumped down on the couch, closing my eyes. I thought my head would explode, I was so bored. Suddenly, I heard a sturdy knock on the door. I rushed over to it, wondering if it was Malin. But then again, she'd probably have a key to her own house, and wouldn't be knocking. Maybe it was Enzie! I opened the front door and there stood a shivering spotted Kougra, getting drenched in the rain. "...Uh, is Malin here?" she asked, looking at me like I had a huge booger dangling from my nostril. "No, she's at work, but she'll be back soon. Are you--"
"--Oh, well, let me in already! It's freezing out here!" The Kougra squeezed in the doorway and wiped her feet on the doormat, shaking her body all around, sending specks of water flying all over. I wiped a drop off of my cheek, narrowing my eyes at her as she walked into the front room. "I suppose you're a friend of Malin's?" "Er, yeah... kind of. I'm staying here for a while," I told her, following her into the kitchen. She opened the refrigerator and took out the carton of milk, taking a few gulps. "Ahhhh!" 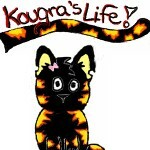 The Kougra wiped the milk she'd dribbled all over her mouth with her arm. "I see. Good milk. Aaaaaaaanyways," she drawled, putting the milk back into the fridge. She sighed and sprawled out on the couch, stretching her legs out and folding her arms behind her head, closing one of her eyes. "Oh, my name's Enzie, by the way. Enzie Mae Tep." "Enzie Maetep?" I questioned, giving her a weird look. Why did she have such a long name? Did every neopet introduce themselves like that back then? "Yeah. And it's Mae Tep. Not MaeTep. You gotta problem with that, bucko?" She exhaled deeply, snuggling into the couch in a more comfortable position, closing both of her eyes. "So, what do they call you?" "Aina--aaah, I mean Sepra!" I told her, rolling my eyes. I'd forgotten that my name was Sepra now. "Well, Aina-I-mean-Sepra, where in Fyora's name is Malin? She's usually back by now..."
I shrugged, looking worriedly back at the front door. What could have happened to Malin? Maybe the Tonu had come back to the café looking for his jewel. What if something bad happened to Malin? I then noticed that her journal was still lying on the ground right in the open. I quickly swiped it up and hid it behind my back, hoping that Enzie hadn't noticed. She opened her eyes and looked suspiciously at me. "Hey, what'cha got there?" she questioned. The spotted Kougra's mouth slowly spread into a wicked smile. "Oh, I know it's something, and I gotta know what it is!" She pounced at me, taking me down to the ground as she purred playfully. The journal got knocked out of my hands a few feet away. Enzie looked over at it and her eyes grew wide. Her expression went blank as she just continued to stare at it. "Is that..."
I reached over for it and got a hold of it, as Enzie moved away from me and let me stand up. I held it close to my chest, not saying a word. I just looked her in the eyes, her sad dark brown eyes. "Is that...? What is that?" she asked, reaching for the journal in my hand. I made a run for the bathroom and Enzie scrambled to her feet to chase after me. I got inside of the small bathroom just in time and slammed the door in her face, locking it hastily. I sighed, sliding down on the floor against the door as I opened the old ripped journal. What was Enzie thinking? She was probably wondering why in Neopia the journal she had bought for Malin was all dirty, looking as if it were one-hundred years old... I hit my head against my knee as I sat there, hating myself for how incredibly stupid I was. Great job, Aina... just leave the journal out in the open for anyone to see. What would've happened if Malin would have come home? Suddenly I heard a squeal from outside the bathroom, and Enzie said, "Malinnnn! You're home! What took you so long?!" I opened the cabinet under the sink and stuffed the journal inside. Hopefully Enzie wouldn't think anything was up. I flushed the toilet and turned on the sink to make it look like I wasn't just in the bathroom for no reason, and I went out into the front room where Malin and Enzie were talking. "So, how was work? Anything exciting happen?" Enzie inquired, hugging Malin tightly. The Cybunny looked like her eyes were going to pop out, Enzie was hugging her so hard. "Well, actually," Malin said as she broke the embrace, "I found something..." She reached into the pocket of her raincoat and pulled out the red jewel. Enzie looked at it as if it were a billion neopoints, and Malin just grinned like a goof. "Oh wow! What is it? Where'd you get it? You found it?!" Enzie exclaimed, touching the surface of the shiny gem. "Yeah, some guy left it at his table... and he never came back..." Malin giggled slightly, and Enzie snorted. "Really? You took it? You thief! Hahaha, that is so great! I never thought Malin, Malin Aniera Lanely, the goody-two-shoes, would ever do such a thing!" the spotted Kougra mused, sticking her long pointy tongue out. "Actually, it was Sepra's idea," Malin told Enzie, pointing over at me. I was sitting on the couch, watching Kin, trying not to be nosy and listen in on their conversation or anything. I looked behind my shoulder at Enzie. "Oh, I've forgotten all my manners! Sepra, this is Enzie; Enzie, this is Sepra. She's staying here for a while... it's a long story, actually. I'll have to tell it to you later when there aren't guests." "Oh. Yeah, we already met," Enzie told Malin, looking away from me and back at the ruby. "Anyway, that is so neat! I can't believe it! How much do you think it's worth? You could probably sell it for like a million neopoints! I mean, look at it! It's huge!" "Well," I heard Malin whisper, "I noticed that it has been doing... strange things. Well, not the jewel, but ever since I found it, strange things have been happening!" "Oh, I don't know. Lots of different things. For instance, while I was taking one of my customer's dishes into the kitchen, they all of a sudden shattered. Broke right in my hands. It was too strange. Then, while I was in the bathroom... I saw... I saw..."
"I saw a ghost," Malin said, sounding dead serious. I cocked my eyebrow and looked back at her and Enzie, who were staring at one another like someone had just died. I snorted, shaking my head. Was Malin just making this up? "Yes, but it wasn't just any ghost. It was the ghost of my grandmother! You met grandmother before, didn't you? Grandmother Avery... I saw her ghost." Malin was speaking in such a convincing voice; I almost really did believe her. But then again, what wasn't to believe? Yesterday I'd found a mirror you could walk straight through and end up in a different time period! "I... I still don't know if I believe you," Enzie lamented. "What? But... you have to believe me," Malin said softly. "What am I supposed to do if my very own best friend won't even believe me?" Enzie sighed, and I turned around so I could watch this argument start to unfold. "Well, I don't know, but I don't really believe in ghosts or any of that, and by the way you've been acting lately, I think you really are making this up! I mean, Malin, stealing? That isn't like you!" Malin looked taken aback, and all of a sudden I felt guilty. I was the one who had told her to take the jewel, after all. Malin clutched the ruby tighter in her paw, glaring at Enzie. "What do you mean? I just wanted to take a chance! Is there anything wrong with that? It's not like you don't do stuff like that! You're the filthiest Kougra I've ever met! You steal stuff when you go to parties, you lie, you cheat, you--"
Enzie, enraged, reached for the jewel, but Malin pulled it away, and a bright jet of red light shot out of it, hitting Enzie, and sending her flying across the room. The Kougra slammed back against the wall, and she sat there, her eyes wide as a pair of golf balls, looking at Malin and the ruby. "... I... I guess I believe you now," she muttered, astonished, as she slowly got up to her feet. The Fire Faerie nodded. "It's often the Light Faerie," she said, coming to stand next to Patricia, "who leads the group. Who makes it all happen..."